The toddler is full of wonder and spends a lot of time watching, observing and imitating. At this age your child is interested in perfecting his motor skills. It is common for him to spend a whole morning going down a slide or riding a tricycle. During this time, help his impulse control along by providing choices, setting limits and showing connections between actions and consequences. As your child gets older, reinforce skills and teach new ones with engaging activities. --Improve abstract thought. 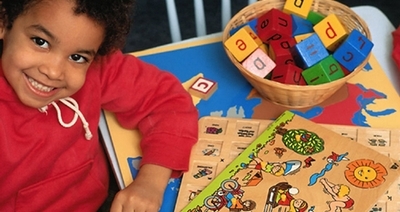 Enhance this skill with games that require organizing and matching colors, shapes, faces and feelings with sets of toys, cards are other objects that go together. --Promote hand-eye coordination. Try stringing large buttons or beads on a shoelace. Teach child to throw, catch and kick. --Encourage an interest in reading and writing. You can both give him books to read and read all sorts of things to him--newspapers, grocery lists, poetry. Point out important words on pages, packages and street signs. Make sure there's always plenty of paper and crayons available. --Introduce numbers. Count objects of interest like cookies, cups, napkins, dolls. When possible, move one at a time while you and your child count them. --Explore science. Explain why and how things work with the help of reference books and simple experiments like magnetic attraction or freezing water. Let your child play with toys that come apart. --Stimulate creativity. Provide ample opportunity for your child to express himself through art, music and theatrics.